This oil painting, Return of the Prodigal Son by Rembrandt van Rijn tells the story of a religious passage. The story that this baroque art print depicts is of a youngest son returning to his father after wasting all of the money he inherited. Bystanders watch as the father forgives his kneeling son. The passage that this art print depicts is Like 15:29-30 in the Holy Bible. In the Return of the Prodigal Son oil painting, there is a mix of warm and earth tone colors. 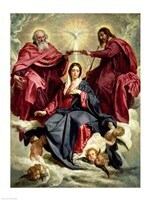 The father and kneeling son in the painting are colored and brighter than the rest of the image. The rest of the painting has monochromatic brown colors that makes it hard to make out the figures in the background. This technique almost creates a spotlight on the father and kneeling son. When decorating with art prints that were originally oil paintings like this one, it makes it look almost like the original when it is put on canvas with brushstrokes. If you choose to go with a frame, it is best to look for frames that bring out the colors that are not well seen like red or gold frames.